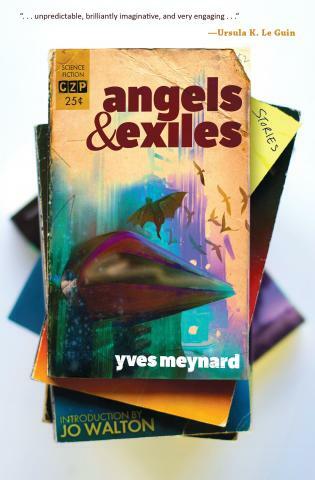 Y ves Meynard is joining us today with his book Angels & Exiles. Here’s the publisher’s description. “We dream of angels, black as space, and wish they could return from the future to warn us of the dark years ahead. We who have forgotten our origin, exiles in a land we may have shaped with our own hands; we who struggle to find meaning in a world that only vouchsafes us deadly revelation; we wage war, for reasons now lost to us, and our hopes are as tenuous as the light of a single star.” In these twelve sombre tales, ranging from baroque science fiction to bleak fantasy, Yves Meynard brings to life wonders and horrors. From space travellers who must rid themselves of the sins their souls accumulate in transit, to a young man whose love transcends time; from refugees in a frozen hold at the end of space, to a city drowning under the weight of its architectural prayer; from an alien Jerusalem that has corrupted the Earth, to a land still bleeding from the scars of a supernatural war; here are windows opened onto astonishing vistas, stories written with a scientist’s laser focus alloyed with a poet’s sensibilities. Looking at the stories that make up my first English-language collection, I have to admit I have a lot of favorite bits in there. It’s unfair to have to choose, but I guess I’ll have to go with the setting of “Hunter and Prey. I’m a rationalist at heart, a dour skeptic; yet that does not at all mean I write Apollonian stories featuring dispassionate scientists who solve problems through the use of logic and slide rules. On the contrary, my SF leans towards horror, while my fantasy strives for rigor even as it spews magic by the barrelful. So it was probably inevitable I would end up writing a story whose protagonist’s belief in a rational, ordered world is revealed in the end as utter delusion. Although it’s a pretty conceit (and one which posed problems for a few readers), that’s not the main draw of the story for me. In my description of an imaginary World’s Fair, I have gone back to a wellspring of my youth, the exhibition known as Terre des Hommes / Man and His World, which began as the Universal Exposition of 1967 in Montréal and remained open year after year until 1981. My family moved to Montréal in 1971; throughout my childhood, my mother, my brother and I would go visit the exhibition and its many pavilions. My favorite one was Le monde insolite, near which stood a semi-abstract statue called Le Phare du Cosmos (seehttp://lemog3d.blogspot.ca/2010/10/un-vestige-dexpo-67-montreal-le-phare.html), which still gives me a shock when I see a picture of it. Its head used to rotate endlessly, displaying in turn its two faces, one with two eyes, the other monocular. Within the sloping walls of the pavilion I was exposed to a torrent of glorious nonsense: UFOs, strange creatures, ancient astronauts, unexplained mysteries. I was young; I thought that adults were smart and sensible people; I believed all of it. How could it be false if grown-ups had expended such effort to display it all? It took me a while to emerge from that state of uncritical acceptance, and I am deeply glad that I did. Still, something was lost in that transition. It may only be youth itself; perhaps this twinge I feel looking at old pictures ofMan and His World is nothing more than nostalgia for those summer afternoons. It may be innocence: I have come to the painful realization that adults are not much wiser than children, that charlatanry is a thriving business and that people want to be deceived. But it probably is the sense that I was living in a wondrous world. Of course that’s an unfair assessment, because the world is still wondrous. The natural world is an endless source of amazement; human culture all across the planet ceaselessly produces works of stunning beauty. You shouldn’t need anything else to satisfy your need for wonderment. And yet it still twitches inside me, that urge for the miraculous. I read stories of the fantastic and write them myself, to assuage it. And I tell myself it’s better to have it only inside of stories. Because if such a miraculous world were real, loaded with revelations and terrible marvels, a world in whose oceans swam hybrids and monsters, a world where everything was charged with transcendent meaning, and all our human conceits were true—that world would devour us. Yves Meynard was born in 1964, in the city of Québec, lived most of his life in Montreal and has recently moved to Ottawa. 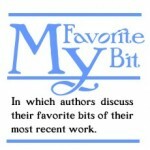 He has been active in Québec science fiction circles since 1986, serving as literary editor for the magazine Solaris from 1994 to 2001. He has published over thirty short stories in French and eighteen in English. He is a multiple award winner, with several Boréal and Aurora Awards, along with the Grand Prix de la Science-Fiction et du Fantastique Québécois, Québec’s highest award in the field. He has published seventeen books in French and three in English: The Book of Knights, a Mythopoeic Award finalist, the massive novel Chrysanthe, and the collection Angels & Exiles. Oh awesome, I’ve been dipping my toes into the waters of Quebecois SF/F, and now I have a new name to look for! Hunh, never read this one, but I did read Chrysanthe.